Double-disk openers create a furrow in which seed is placed. They work best in a prepared seedbed and leave the field relatively smooth, with minimal soil throw. The double-disk openers are available with 150-, 190-, and 254-mm (6-, 7.5-, and 10-in.) row spacings. The 150-mm (6-in.) spaced drills have nominal residue flow in minimum till conditions. The 190-mm (7.5-in.) spacing is recommended for wet, sticky soil conditions such as the Red River Valley. Cast-aluminum boots are standard equipment. Openers come with a zigzag pattern, with alternate short and long drawbars, to provide good trash flow in varied field conditions. The alternating of blades with a right/left leading-edge offset improves penetration. Blades are offset with a 6-mm (1/4-in.) leading edge, and the pinch point is close to where the blades meet the soil for better penetration and residue cutting. 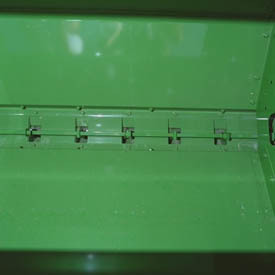 Seedboxes have a large capacity for longer intervals between stops for refilling. All boxes are plain grain with a large single lid for accessing the seedbox. 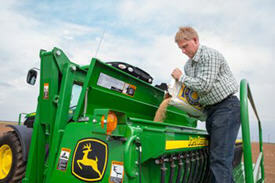 A grain agitator is available to help move seed to the meters. Agitators are recommended for drilling trashy, inoculated, or very light or large seed. Required for drilling peas. 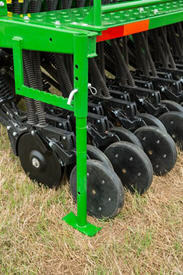 The grass seed attachment is used for accurate metering of grasses, forages, small grains and oil crops such as canola. This attachment is well suited for set-aside ground and waterways. The grass seed attachment mounts to the rear of 1520 grain box and meters seed by fluted feed cups. The seed tube delivers the seed to the double disk opener placing the seed in the seed furrow. Track eradicators include S-tine shanks (less sweeps). S-tine shanks track eradicators with sweeps are available. These are used to lift tractor tire tracks from the seedbed. The track eradicators attach to the drill frame in front of the openers. NOTE: Not compatible with coulter cart. May need to adjust at Quik-Coupler.